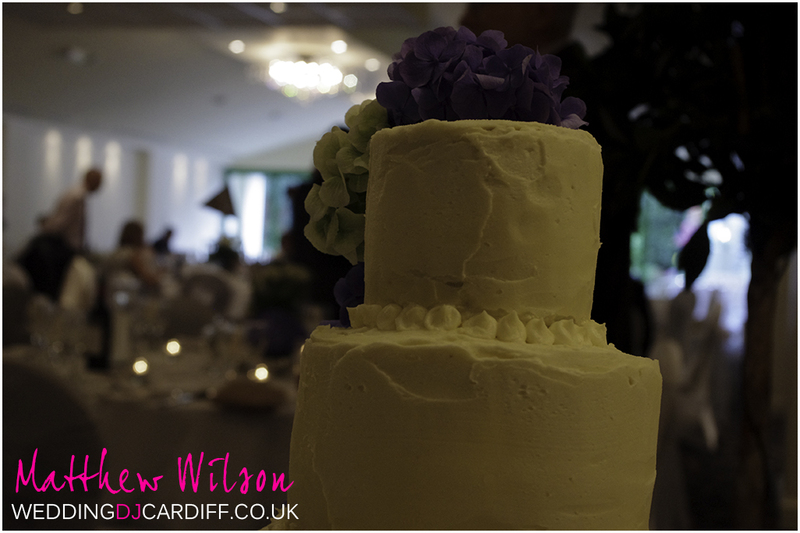 On the 14th September 2013, I woke early and made my way to the Bear Hotel in Cowbridge for Cassie and Mark’s wedding. Cassie and Mark had booked me a year in advance, so we had plenty of time to discuss the wedding plans in detail. While the wedding ceremony took place in the main building, I was in the St Quentin’s Suite setting up the speaker system for the wedding breakfast background music and speeches. After the wedding breakfast and speeches, the guests headed up to the bar in the main hotel while the room was re-arranged for the evening reception. I set up my system at the edge of the dance floor and used the uplighting hire around the room to create a beautiful effect. As the guests returned to the St Quentin’s Suite, I kept the evening disco lighting and mood lighting off, ready for the first dance. The guests had no idea how good the room would look until I flicked the switch and the entire room lit up! After the first dance, the dance floor was not empty for a single second, with it being packed for the majority of the night. This is something that all couples want on their wedding night – fun, fun, fun. One of the guests remarked that she wanted some more rock although she also mentioned that she’d never seen a wedding with such a busy dance floor! The music played was a mix of party classics with some requests thrown in too. One of the bridesmaids requested Jason Derulo – Talk Dirty, which is now the UK’s No.1 single. She and the bride Cassie definitely enjoyed this one. The wedding at the Bear Hotel Cowbridge went on and the guests kept dancing, all too soon we had reached the end of the evening. Mark and Cassie took to the centre of the dance floor with the guests encircling them to end a fantastic wedding.